Press release after the cut. NEW YORK and TORONTO, January 17, 2011 – North America’s largest pop-culture tour continues as Wizard World Toronto Comic Con returns to the Direct Energy Centre, March 18-20, with superstar guests Billy Dee Williams, Julie Benz, David Prowse, Daniel Logan and Scott Thompson headlining the list of celebrity attendees. The event will bring together thousands of fans of all ages and dozens of celebrities and industry professionals to celebrate the best in pop culture, movies, comics, toys, video gaming, television, gaming, original art, collectibles, contests and more. The iconic Williams, known to millions as “Lando Calrissian” in STAR WARS: THE EMPIRE STRIKES BACK and for memorable roles in BATMAN and BRIAN’S SONG, will be joined in Toronto by other popular STAR WARS guests Logan (“Boba Fett”) and Prowse (“Darth Vader”). Fans are also greatly anticipating the appearances of Benz, who has starred in “Dexter,” “No Ordinary Family,” “Desperate Housewives,” and “Buffy: The Vampire Slayer,” and Thompson (“Kids in the Hall,” “Star Trek: Voyager”). Other popular Toronto Comic Con celebrity guests include Claudia Christian (“Look”; “Babylon 5”), Nicholas Brendon and Clare Kramer (“Buffy: The Vampire Slayer”), Kate Vernon (“Battlestar Galactica,” PRETTY IN PINK), Academy Award Winner© (special effects) Tom Woodruff Jr. (THE TERMINATOR, SPIDER-MAN), Daniel Kash (ALIENS, ROBOCOP), Robert Maillet (300, SHERLOCK HOLMES) and Chandler Riggs (“The Walking Dead”). Fans can also meet their favorite comic creators and artists, including Carlos Pacheco (“X-Men,” “Green Lantern”), Mike Grell (“Green Lantern,” “Green Arrow”), Yanick Paquette (“Batman,” “Superman”), Mitch Breitweiser (“Captain America,” “Deadpool”), Jeff Parker (“Hulk,” “Spider-Man: 1602”), Gabriel Hardman (“Hulk,” “X-Men”), Bruce Jones (“Incredible Hulk,” “Nightwing”), Phil Jimenez (“Amazing Spider-Man,” “Astonishing X-Men”), Greg Horn (“Daredevil,” “Green Lantern”) and Michael Golden (“Wolverine: First Class,” “New Exiles”). The Toronto Comic Con Wrestling section includes the popular Ted “The Million Dollar Man” DiBiase and diva Lisa Marie “Tara” Varon. Children and adult attendees are encouraged to come dressed as their favorite villain, superhero or pop culture personality for the chance to win special prizes in costume contests. Event-goers may also try their hand interactive product exhibits and shop for collectible comics, movie and television memorabilia, toys and games at more than 100 dealer booths. Special events at Toronto Comic Con include the “Magic: The Gathering” card game tournament, professional photo opportunities (Photo Ops), movie screenings with celebrities and others. 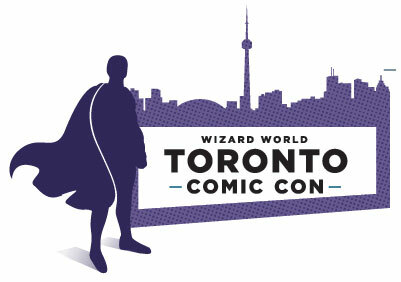 Toronto Comic Con is the third stop on Wizard’s 2011 North American tour, which to date has 13 events scheduled. Hours are Friday, March 18, 4-9 p.m.; Saturday, March 19, 10 a.m. – 6 p.m., and Sunday, March 20, 11 a.m. – 6 p.m.. Tickets are available in advance online at http://www.wizardworld.com/toronto.html at up to a 40% savings over tickets purchased at the door. Advance adult single-day tickets are $25 ($35 on site); three-day weekend tickets are $45 ($55 on site), and tickets are free for children age 10 and under when accompanied by a paid adult (limit two children per adult). VIP packages with special entry and exclusive items are also available. The Direct Energy Centre is located at Exhibition Place in Toronto. It is Canada’s largest facility for conventions, exhibitions and events. Exhibition Place, a 192 acre waterfront campus located in downtown Toronto, is home to a variety of venues including Direct Energy Centre, Allstream Centre, Better Living Centre and the Queen Elizabeth building among various other tenant properties. Join tens of thousands of fellow fans as they converge on the Direct Energy Centre in Canada at Toronto Comic Con to celebrate the best in pop culture. Canada’s Toronto Comic Con brings it all – Movies, Comics, Toys, Video Gaming, Games, TV, Horror, Wrestling, MMA, Original Art, Collectibles, Anime, Manga & More! Toronto Comic Con is brought to you by the group who produces the most widely attended Comic Con tour! For more Toronto Comic Con guest and programming updates, become a fan of TORONTO COMIC CON on Facebook! Follow us on Twitter by CLICKING HERE! Save up to 15 percent off the price of tickets by ordering your tickets in advance. Tickets are more at the door. GET TORONTO COMIC CON TICKETS NOW! GET TORONTO COMIC CON VIP TICKETS NOW! Full disclosure and end note: From 2003-2007 I was theoretically co-owner of the now defunct “Toronto Comicon”. After five critically successful and economically unsuccessful years I walked away from the project. Since 2007 I have been contracted to act as the Canadian Guest and Comics Programming Coordinator for the seasonal “Toronto ComiCONs” and for “Fan Expo Canada”TM. In 2009, Paradise gave up what was left of the convention to American convention promoter Wizard World, who absorbed it along with many other local conventions for their World Tour, a series of formula pop culture events across all of North America. In Canada, they are currently the owners of not only the “Toronto Comic Con” but as of November 2010 the “Central Canada Comic Con” in Winnipeg, Manitoba. Last year I went down to the debut event, after being invited by the Wizard folks. They are back for more in 2011, so hopefully they’ve stepped it up on the comics ends of the show. FYI: Carlos Pacheco, mentioned in the press release, is no longer listed as a guest on their website. Other high profile announced guests like Joe Mad and Ethan Van Sciver have also disappeared without any details. This event now coincides with the magic-themed Wizard World which runs at the same facility from March 13-20. It has jungle cats! This entry was posted in Happenings, Op/Ed, Press Releases by Kevin A. Boyd. Bookmark the permalink.